Full of laughter, tears and everything in between, PLAY ON! 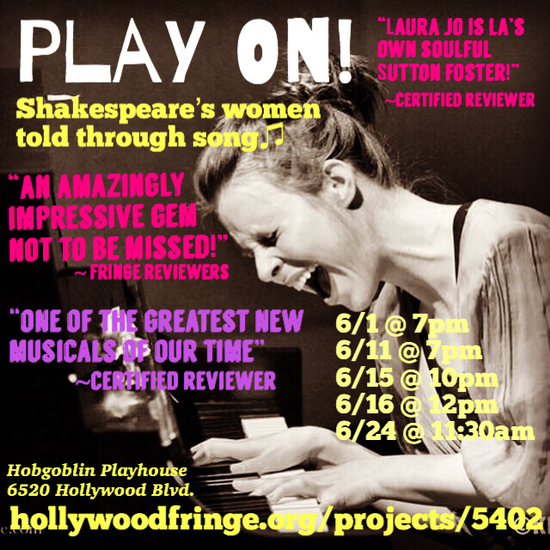 is an innovative and refreshing modern day musical retelling of Shakespeare’s most famous women. From Juliet to Rosalind to Lady Macbeth, audiences will experience each woman’s unique story told from her perspective through song. Don’t be intimidated by the language of Shakespeare! Whether you are familiar with his plays or not, PLAY ON! can be enjoyed by all audiences. The lyrics are a mix of both Shakespearean and contemporary text, inviting audiences to sit back, relax, and enjoy musical storytelling in way they’ve never heard before!